Comprehensive automotive diagnostic and repair resource. Online searches, technical service bulletins, wiring diagrams printable on 8 ½ x 11 paper. A genealogical collection with broad coverage of the U.S. and the U.K., including census, vital, church, court, and immigration records, as well as record collections from Canada and other areas. This resource comprises 4,000 databases and 1.5 billion names. Containing many of the top-ranked biographical reference collections and magazines, this database offers a comprehensive collection of full-text biographies, as well as thousands of unique narrative biographies. This resource provides superior coverage for several of the most popular and heavily-researched biographies and genres, including those contained within Biography Today and Biography (both dating back to the first issue published). Whether you are new to the computer, returning for review or just want to gain more 21st century skills, our free computer tutorials can help. From Computer Basics to Microsoft Office to Apple, you can find a wide range of free technology tutorials to choose from. Basic math tutorials and learning interactives make learning math easier, and allow you to practice basic math skills at your own level and pace. Reading tutorials are designed to help adults at all levels become better readers, and help non-native speakers improve their English vocabulary and reading comprehension. The single-most comprehensive resource for consumer-oriented health content. It is designed to support the information needs of patients, and to foster an overall understanding of health-related topics. CHC provides content covering all areas of health and wellness from mainstream medicine to the many perspectives of complementary, holistic and integrated medicine. A series of reference tools on world cultures, including maps, statistics and other information on 187 countries and the 50 U.S. States. Driving-Tests.org offers free practice tests, based on the Washington State Department of Licensing’s actual materials. Practice for your car, motorcycle, or CDL exam in English or Spanish. Search across multiple database collections including academic journals, newspaper sources, magazines articles (including Consumer Reports), general reference publications, images, and, as well as selection of eBooks and eAudio Books. Visit eLibrary without a card number while inside the library. eSequels is an online guide to series fiction. It lists titles in the correct reading sequence so you can begin at the beginning rather than blunder into the middle of "Act III." Fire Insurance Maps online (FIMo) is a research portal to find and view high-definition, color Fire Insurance Maps, Real Estate Atlases, Plat Books, and other historical maps showing building structures, building construction details, property ownership, property uses, and other useful information. 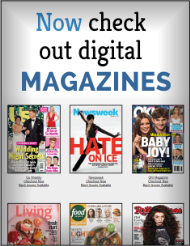 Click on the Flipster link to easily access a site where you can browse available magazines like People, Entertainment Weekly, and Consumer Reports. You can then click on a magazine to view it within your browser. This means you can access Flipster from any computer, laptop, or mobile device, as long as you are connected to the Internet. Immediate scoring on more than 300 interactive practice tests including ACT, SAT, GED, ASVAB, Firefighter, Police Officer, U.S. Citizenship, Postal Worker. Providing exclusive online full text for many of the top consumer legal reference books, Legal Information Reference Center contains hundreds of full-text publications and thousands of legal forms, with more content being added on a regular basis. Each issue visually published by Time Inc., Life Magazine has featured story-telling through documentary photographs and informative captions. Each issue visually and powerfully depicted national and international events and topical stories, providing intimate views of real people and their real life situations. This collection contains more than 2,200 issues with coverage from 1936-2000. This comprehensive, full-text database provides a broad spectrum of information on thousands of authors and their works across literary disciplines and timeframes—to give students, professors, and researchers a foundation of literary reference works to meet their research needs. Lynda.com offers a wide variety of expert-taught courses on topics including photography, business/management training, web design, graphic design, computer coding, and much more! All you need is your library card number, PIN, and an email address to take advantage of the thousands of high-quality courses on Lynda.com. Mango offers access to 60 foreign language courses and 17 English courses taught completely in the user’s native language. In addition to traditional language courses, Mango also offers the opportunity to learn through foreign film with Mango Premiere™ and access to a variety of specialty mini courses, like Pirate, Medical Spanish and romance courses. Mango can be accessed at the library, remotely, or even on-the-go with apps for iPhone®, Android™, Kindle® and Nook®. Health information from the National Library of Medicine. Easy access to Medline and Health topics, medical dictionaries, directories and publications. An excellent source of information about drugs & supplements, diseases and conditions, and a variety of medical issues. This medical information source provides current and continuously updated medical and health information for consumers and professional caregivers. The Merck Manual offers content in multiple formats, including expert commentary, infographics, video clips, health tracking tools, pill identifiers, and guides to medical terms. Mergent Intellect is a flexible web-based application that features a deep collection of worldwide business information that enables companies to generate insightful business intelligence. Coupling Mergent's expertise in developing products for the reference marketplace with Dun & Bradstreet's private company database, Mergent Intellect offers new and existing clients a unique opportunity to access private and public U.S and international business data, industry news, facts and figures, executive contact information, the ability to access industry profiles and much more. Online videos and tutorials covering MS Office and other Microsoft technologies. Find global information on topics related to business, economics, education, government, health, homework help, international studies, politics, science, social issues, sports, STEM and more from a variety of news media featuring newspapers, videos and web-only content. These materials were compiled by digitizing some of the Northwest Room archives, as well as partnering with institutions and individuals to share their private collections. Images found in our digital collections may be downloaded and printed, used freely for research and enjoyment, and linked to from other websites if properly credited. If you wish to use images from the digital collection for publication, please contact us to verify that we hold the rights to the image. If we do, we will provide you with a high resolution image file and ask that you properly credit the Everett Public Library. NoveList K-8 contains materials for all K-8 grade levels and includes picture books, children's "chapter" books and young adult titles. It also contains a wealth of materials written especially for teachers and media specialists. OCLC connects students, researchers and patrons over 48 million catalog records for books, videos and other materials each attached to a list of the member libraries that own the item. This is considered the official U.S. newspaper because it publishes the complete text of important documents, speeches and presidential press conferences. The paper's reporters have won scores of Pulitzer Prizes throughout the publication's 150-year history. Comprehensive coverage back to 1984 is available from the world's leading financial newspaper through the ProQuest database. The first issue of The Wall Street Journal was four pages long and sold for two cents. Today, the paper is considered the preeminent publication for business news and information on financial markets worldwide. Leading newspapers from the Western Region of the United States including Washington State. Indexes 3,600 magazines and journals—2,000 of which are full text, as well as several national and Washington State newspapers. Indexes 1,000 business and management journals, trade/industry publications, 460 of which are full text. Provides directory information for over 10 million U.S. businesses, organizations, & governmental agencies, along with white page directory information for individuals for the entire U.S.
Nine how-to guides that will help you plan for & select the right insurance and financial product. Each easy-to-read, step-by-step guide offers a narrative about the subject, what you should look for when choosing a plan or policy, recommended companies to work with and so much more. Plus, each guide includes several helpful Worksheets & Planners to further aid your decision-making process.